Stop 2 on Thursday night brought me to the Burgundian bar in Seattle. Cidermakers from Eden Ice Cider (Newport VT) and Alpenfire Organic Hard Cider (Port Townsend WA) were on hand to chat, they were pouring ciders from each, and there were even specialty cocktails using their ciders. It started off very slow at 5pm, but that worked very well for me as I got some awesome conversations in while there were more industry folks than customers. I met Kyle from Millstone Cellars (Monkton MD); I had e-mailed with him about their Cobbler cider and he remembered me. I also met Dan from Orcas Distributing, which is one of the main cider distributors in the Seattle area. I got to see both again the next day at Cider Summit. The special event menu is below (click to biggify). They also had a number of bottle pour ciders from Eden, Alpenfire, and more. There was unfortunately only one draft cider as they apparently had some logistical issues. 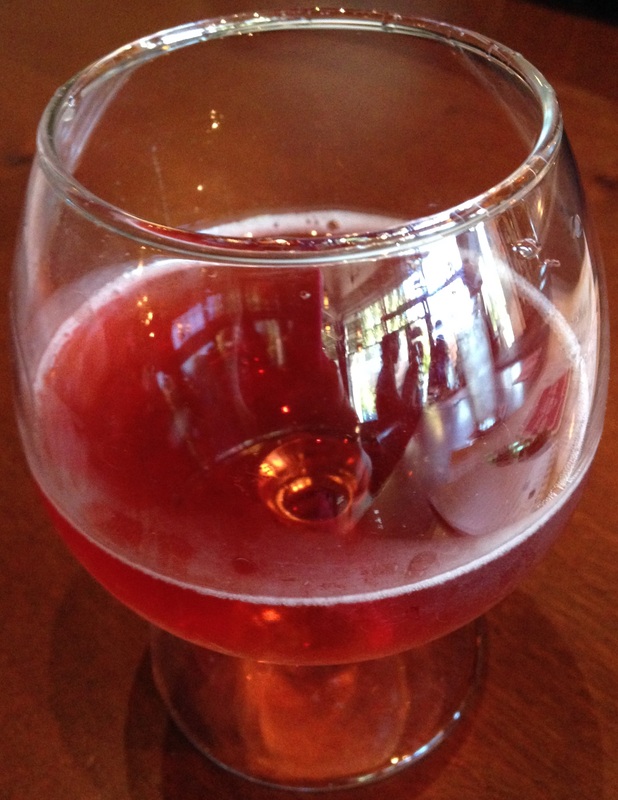 I started with a glass of Alpenfire Apocalypso, a double rum barrel aged blackberry cider. This is their Calypso cider but rum barrel aged for four instead of two months. This draft-only cider was $6 for 6oz (Calypso runs about $13 for a 500ml bottle). 6.9% ABV. Middle of the road sweetness. Berry with a touch of wood scent. Lovely berry hue. Fruity, moderately tart, with a hint of barrel influence. Very tasty! It had more complexity than your average fruity cider, which I really enjoyed. There haven’t been too many fruity ciders I’ve been impressed with, but this is one. Apocalypso is probably a tie with Spark! for my favorite Alpenfire cider so far. I chatted with Eleanor Leger from Eden Ice Cider for quite awhile. it was awesome to learn more about Eden’s ciders, as I had seen them and was very interested, but hadn’t tried any yet. 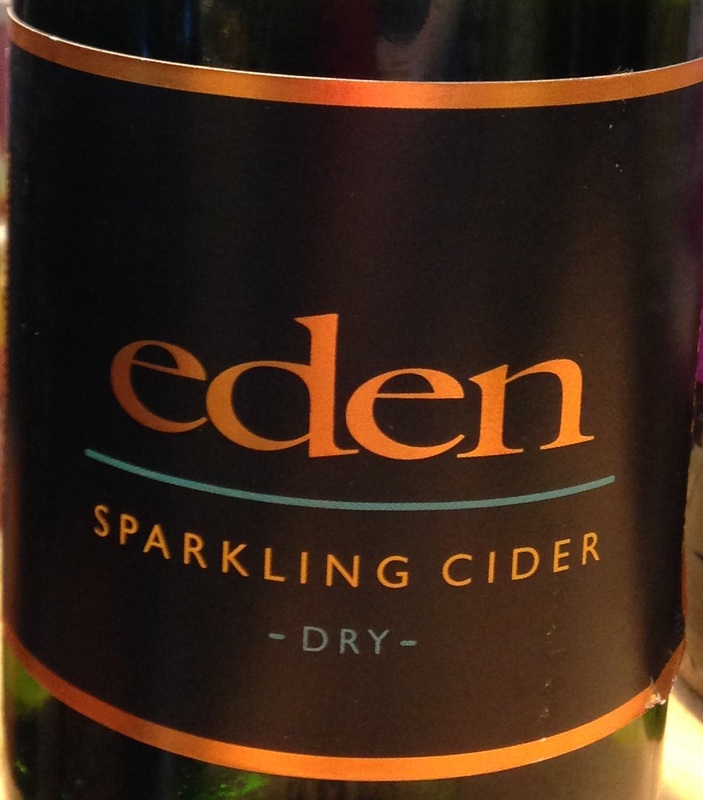 Eden’s ciders are made by husband & wife team Eleanor & Albert Leger. They specialize in and started with ice ciders, but have also branched out into aperitif and traditional ciders. In addition to offering their customers more variety, both of these products are a way for them to use the same juice as their ice ciders, from a second and third pressing (the sugar content decreases). They may actually be the only company selling cider apertifs at this time. It was interesting to hear they are even trying to find uses for the “apple water” which is left after making the cider, such as selling it to a gin distillery which would use it in place of water for added flavor. They were the first ice cider company in the U.S. and also have their own orchard of cider apples. Ice cider by the way is a dessert wine variety which was developed in Canada, and is made from apples which have been concentrated by natural winter cold. The apples are harvested at peak ripeness then kept in cold storage. After pressing, the juice is set outdoors to freeze for 6-8 weeks, which results in a residual concentrate which is high in sugar and flavor. The concentrate is then fermented, cold stabilized, filtered, and bottled, leaving a high alcohol and high residual sugar cider. The final amount of cider is typically less than 1/4 of the original amount of juice pressed. Eleanor told me approximately 20% of their juice is used for ice cider, 7% for apertif, 8% for cider, and the remaining 65% is “apple water”. I then tried Eden’s Oak Aged Sparkling Dry Cider, 8.5% ABV, $9 for a 6oz bottle pour (runs around $10 for a 375ml bottle). 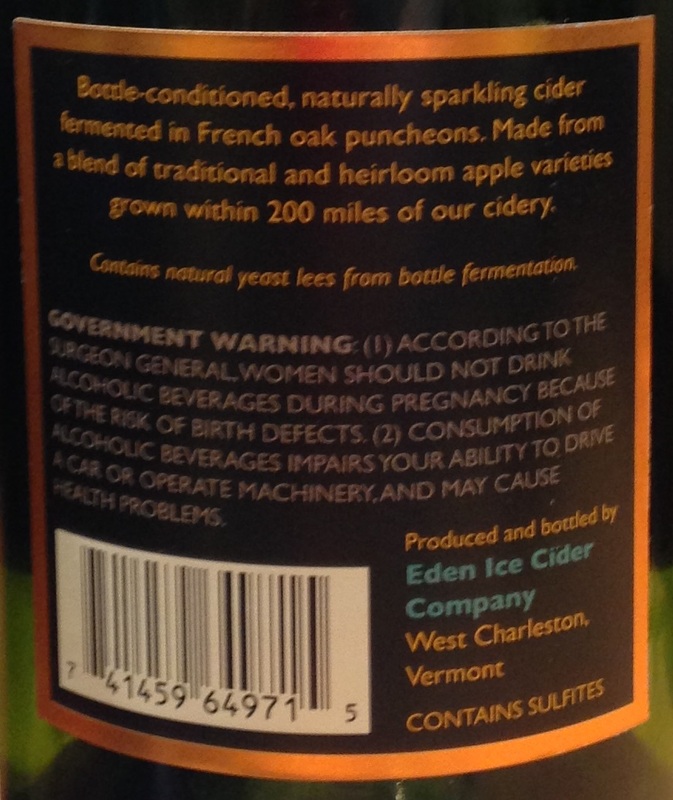 This is Eden’s first traditional cider (also available in Semi-Dry), released in 2013, and distribution was expanded outside of VT in 2014. It is naturally sparkling from bottle conditioning using juice, not sugar (Methode Champenoise, which is VERY labor intensive; here is a great explaination). This cider is crafted from traditional and heirloom apples (50% Kingston Black) grown within 200 miles of their cidery, aged in French oak puncheons (twice the size of typical barrels) for one year, then bottle conditioned for six months.. The purpose of the barrel aging in this case is to impart a more mature flavor, and it can actually increase the amount of tannins as well (vs. when a barrel from spirits is used it would also impart the flavor of the spirit, such as bourbon). Using such a large amount of Kingston Black apples is expensive, and Eleanor discussed the cost difference between using juice pressed from dessert apples ($2.50-4.00 / gallon) and juice pressed from cider apples ($8.00-10.00 / gallon) to make cider. The high cost is primarily due to their rarity. Hopefully in the coming years the cost will go down as availability increases, which will also increase the quality of ciders as more cidermakers use cider instead of dessert variety apples. In addition to apples from Eden’s own orchard (which has about 1,000 trees and took approximately 5 years to go from planting to first harvest), they use a lot of apples from the nearby Scott Farm on Kipling’s estate, which is an old Macintosh orchard which was top grafted with many heirloom and cider apple varieties. I also learned about Eden’s newest product addition, Imperial 11 Rose, which is an off-dry lightly sparkling 11% ABV cider made from heirloom apples and red currant. Perfect for the wine-loving cider drinker. On to the Eden Sparkling Dry cider tasting notes: Lovely brilliant amber with tiny bubbles and a light foam ring. Definitely dry, but there was a touch of residual sweetness. Ripe apple scent and taste. Moderate amounts of acidity, tannins, and bitterness. Mild tartness. Medium bodied. High carbonation. Hints of earthiness and funk. Very well crafted and balanced. I could really taste the difference from using cider apples (vs. dessert apples) and bottle conditioning (vs. force carbonating). A perfect cider alternative to champagne. Yum! It was a special treat to enjoy it while sitting and chatting with the cidermaker. I typically have trouble tolerating both dryness and bitterness in a cider, but both were so well balanced with the acidity, tannins, and carbonation that I found the cider enjoyable. I may have to pick up a bottle of this to have on hand; the small bottle size and reasonable cost (moreso per bottle not per ounce) are nice. I also met Nancy Bishop and her son Philippe from Alpenfire. Ron from DrinkingCider.com and crew also showed up later! Eleanor from Eden even brought some specialty ciders with her all the way from VT that aren’t available here in WA. I had to leave before the event was over as I had work at 6am the next day (Friday) so I was unfortunately only able to taste one, dubbed “Cinderella’s Slipper”. It was a very special variety that hasn’t been released. It was their first cider made only from (35 varieties of) apples from Eden’s own orchard. It had literally been forgotten about, sitting in a tank at Eden’s old facility for a year. I found it to be dry, still, slightly tart, highly acidic, and high in tannins. Very unique! 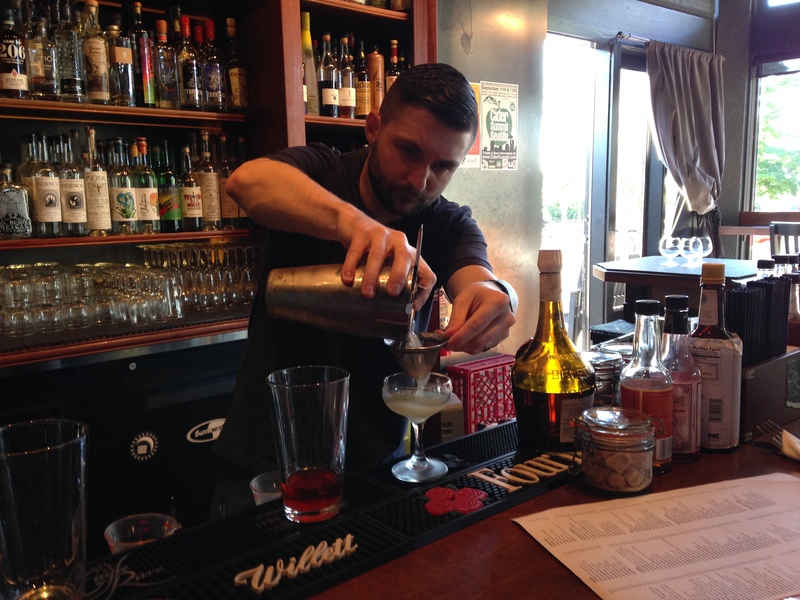 Here is a photo of the bartender at the Burgundian making one of the specialty cocktails by the way. They were all very pretty and involved many interesting ingredients (time consuming for the bartender when Eleanor decided to try all four lol). See the photo of the menu at the top of this post. However, I didn’t try any, as I am pretty picky when it comes to food & drink, especially cocktails (I don’t like gin or any aged spirits for example), and none of them sounded good to me. Plus, I don’t really get the point of mixing high end cider into a cocktail; to me it would be like mixing expensive vodka with orange juice or whatever. I’d rather drink the cider on its own and get the full experience of it! I will admit I haven’t tried a cider cocktail though, and its something I want to do. Cider cocktails seem all the rage lately around here, with Capitol Cider pouring them at Cider Summit, and Darlene Hayes even wrote a book all about them! I was lucky enough to meet Darlene Hayes at Cider Summit and chat with her for a bit (she likes my blog by the way–very cool). Check out her blog as well, All Into Cider, which has some great stories and information about cider. Stay tuned for more Washington Cider Week posts at Cider Says. Up next are posts about Cider Summit itself (including more tasting notes on Eden and Alpenfire ciders), then the Bill Bradshaw tasting event at Capitol Cider, and Schilling Cider House (2 Towns night but also hoping for some barrel aged ciders left from the night before). I have quite a lot of photos and tasting notes to go through from Cider Summit though, so I apologize if there is a delay in the Cider Summit post/s. To give a hint, I believe the final count is 33 ciders that I tried! However, I have some other cider review posts to cue up in the meantime. Cheers!